Last full day with us. And it rained. That kind of put a damper on going fishing. Rich and Bel made a couple of valiant attempts to get down to the river and fish. After freezing a bit, they had to call it quits and head back. Then it proceeded to rain most of the day. I sent Rick out for some groceries. Kind of hard to have tuna fish sandwiches without bread. After lunch, we hung around for a while. I was still working around the noise and commotion. Bel loves to tease (or is it torture?) Rick. She’s very good at it also. Rick was giving piggyback rides and just generally entertaining the kids for a while. Then I really needed quiet, so Rick took them down to the basement to watch some TV. I got to do my phone calls in relative peace. I had Rick show Bel all of his guitar equipment. They split up some picks that Rick was holding and used the punch to make a couple of news for Bel. She got to use the fingerboard to exercise with and play with the traveling guitar. Just a few more toys that she can ask for Christmas. The rain let up and Rich thought he would venture out with the kids. They took off for Moraine State Park to walk the Lake Defiance trail. It wasn’t too mud and they were outside to burn off some much needed energy. After the short hike, they drove over to the McHenry Dam to check out the sights. Apparently, one of the fisherman caught a huge carp. Since Rich was wearing his Got Carp? t-shirt, the guy showed off the fish and the others he caught to the kids. He had a couple of nice sized drum as well. Bel was dreaming of fishing, I think. Back at the ranch, I was finishing up the work I had planned to get done. I put the kids in the car and headed to the Dollar Store. Doesn’t sound like much for a trip, but the kids hadn’t spent any of their money yet. 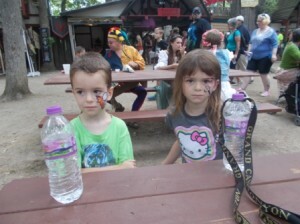 They didn’t take their money to Ren Faire and didn’t really want anything. Then they forgot to stop by the gift shop at the mooseum. Apparently, they didn’t remember they wanted to go in until they were almost home again. Then we made it home in one piece again with most of our money. It was time for dinner. Originally, we were going to sit out on the deck at Vickie’s, but the weather still wasn’t cooperating. I guess this means we’ll have to settle for an inside location. Nick’s Pub should work. With all the peanuts, shells on the floor and dead animals hanging on the wall, it was a good kids’ place. While making our way through pizza, peanuts, and drinks, we talked about our time together. We discovered we had a lot of firsts. 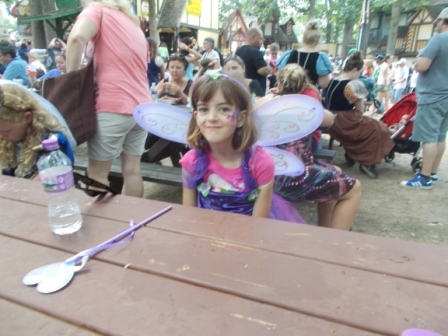 First….eating Spam, in a bog, time in Wisconsin, at Ren Faire, eating garlic mushrooms, eating peanuts at dinner, and probably a bunch more things I can’t remember. Tomorrow morning, we pack up everyone and head back to Michigan to meet up with Vanessa. Time to drop the darlings back off with their Mom. We will miss them. It’s been fun. However, I’m tired! It’s already Day 4? The day was rainy to start. That was a carryover from last night as well. It stormed pretty good here. I know I woke up in the middle of the night with thunder and lighting. I was sure the kids heard and woke up. But no, I was the only kid who woke up. Rich woke up once because the sump pump wasn’t turning off. There was that much rain. My alarm went off pretty early. Yeah, I was going to work today. Rich and Rick were in charge. It’s not as scary as it might sound. The kids got up around 7:30 or so. I think we might be getting them trained. After deciding what to have or not to have for breakfast, Rich packed up the lot and headed down to the river with them. Rick got up a little bit later and followed soon after. 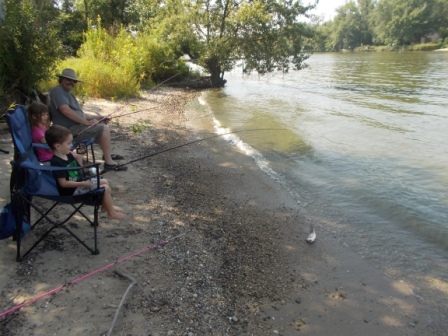 Since I was working, I didn’t get a firsthand account of the fishing. We also don’t have pictures to prove the stories I got. I guess the count is now 1 fish a piece for Bel, Sophia, and Cael. Just to be different, Rich caught two turtles. No fish. I guess that would be too easy, right? So with fishing under their belts for the day, it was time to head out on the next adventure. Rich and Rick packed up the carload and off to Rockford they went. That’s Rockford, IL. 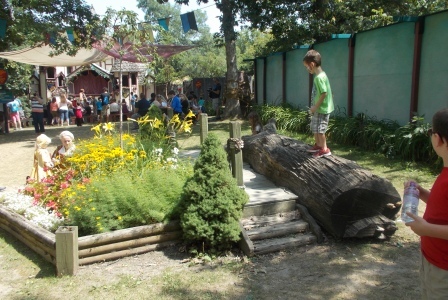 The Burpee Museum houses some nice exhibits and has the next best dinosaur in the area. Her name is Jane. She had been living in the basement over the last few years. Recently, Jane got promoted to the upper floors. Turns out, Jane is an adolescent and not a full grown female. From the kids’ perspective, she is only a little older than themselves. She is more like some of their cousins then. If I had to guess, I’d say she is probably about the age of Erica. Maybe they should have called her Erica, right? So the group toured the museum and took in the sights. I guess there were fluorescent rocks that everyone examined. 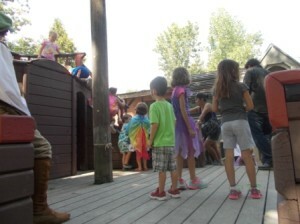 The kids decided the primitive Indian exhibit was lame. They’ve seen better. You know how this generation is today. Always have seen better. Sounds like Cael has an interesting pronunciation for museum. I gather is it something along the line of mooseum. The joke I heard was that it was dedicated to cows or something. Lunchtime was at one of Rich’s old favorites in the area. They went into Beef-a-Roo. The ordering was difficult to get correct, but it sounds like they only had to take a couple of things back for correction. Now the kids can say that they’ve eaten at Uncle Rich’s favorite place. Then it was time for the return trip home. Between here and Rockford, there is a lot of farm land. Yesterday, we saw a lot of horses. Today, I bet they saw a lot of cows. Probably smelled a lot of cows also. Back at the house, everyone was tired, except for the kids. Can you believe it? They actually had to find something to do all by themselves. Since the rain had washed the driveway clean, it was time to take chalk and go back out to decorate that plain black space again. There were a couple of rainbows. Another butterfly was drawn. The pictures were colorful and filled in the spaces where each kid was setting. 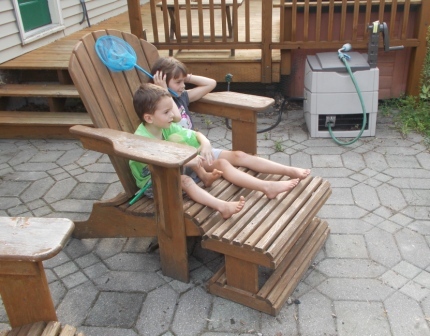 Since it was warm, I got out the sprinkler for them to try out. We didn’t get to do this last year because the weather didn’t cooperate. It was a straightline sprinkler with lots of wriggling lines throwing water everywhere. I enjoyed the little sunshine peeking through the clouds as kids were screaming and running around wet. Then it was decided that they had had enough. 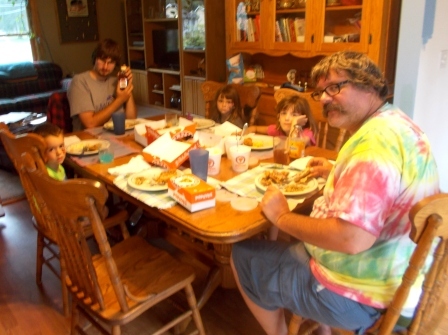 After getting dressed, we got Rick out of his room to cook the burgers for dinner. He’s a pretty good cook. Bel likes to give him a hard time. She’s good at it, too. Dinner was a little of this and a little of that to go with the burgers. Green Kool-aid was the drink of choice tonight. Thanks for picking that out, Sophia. Everyone scraped their plates and we loaded up the dishwasher. That is right after Sascha finished with prewash. Then it was time for Bel to go down and practice guitar with Uncle Rich. She’s getting lessons on finger practice. It takes a while to stretch out those fingers to run up and down the fret board. She already has her wish list for things that she needs. Those all sounds like good Christmas gifts. So the evening is young, but all the adults are still tired. It’s hot outside. We might just have to opt for watching a movie or two and hanging out. Maybe there is popcorn in the near future to go with that movie. Sascha says yes since that’s her favorite treat. As I’m writing this up, I hear Led Zeppelin come on the speakers downstairs. I think the kids are getting a lesson is early rock and roll to go with the guitar lesson. That’s good. Uncle Rich has a wealth of music history knowledge that he likes to share. I’m sure we’ll be hearing one of everything soon. 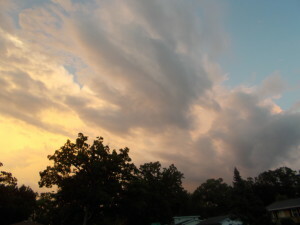 It stormed for a while and then it all passed. 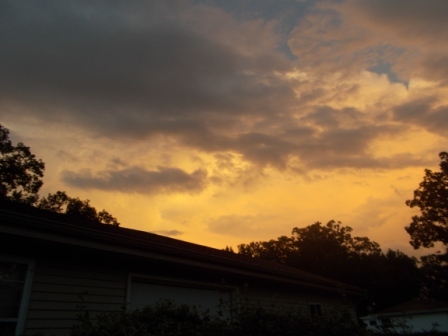 We went outside to see the clouds moving on and the sun lighting up everything. Sun going down after the storm. I had warned the kids that we would be getting up early today. When 8:00 AM rolled around, I started rousting people from their beds. We needed to get up and get some sort of breakfast before we prepared for the day ahead of us. Today…..we go to Ren Faire! Bel was the last one up. Luckily, Sophia and Cael climbed out of bed before the warning bell went off. Rick was up early, of course. Gotta say, Bel didn’t put up much of a fuss though. After breakfast, we began to prepare to get dressed. I had gotten fairy costumes for the girls and planned to use an older outfit for Cael. When it came right down to it though, Bel was the only one willing to get dressed up. She was cute. Sophia and Cael opted to go as normal folk. That’s fine. We packed up the car and headed out. Rick had invited his friend, Carrie, to join us. They drove over separately and we met up with them off and on throughout the day. We got into the gate and it was still relatively open. The crowds weren’t out en mass yet. The first place to head was facepainting. I knew which painter I liked already. She has been in this same spot since Rick was small. We just had to get there before the rest of the kids did. Cael was first. He picked a flaming skull. You know guys and that counts for the little ones. Sophia got the Fancy Butterfly while Bel went for the Pegascorn. Our next stop was through the woods and to the area where the fairies are known to hang out. 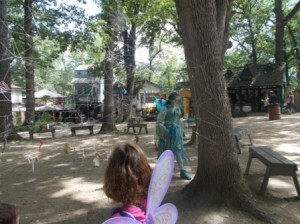 Here, a wood fairy weaves a spider web between the trees and includes all kinds of things in the weaving. 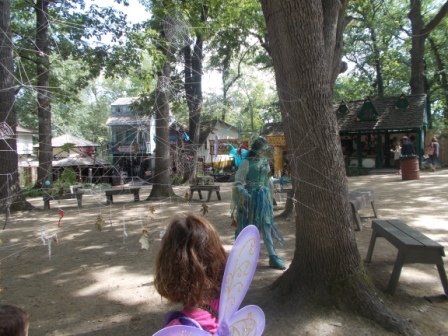 The web turns into the walls for an almost outdoor room where benches are set up and you can rest among the fairies. 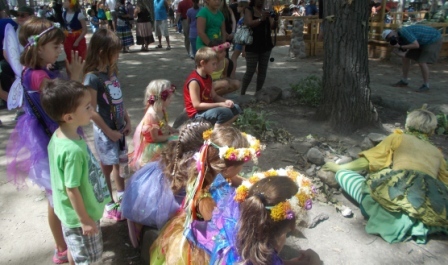 Even Cael was entranced to watch the different types of fairies and magical creatures. 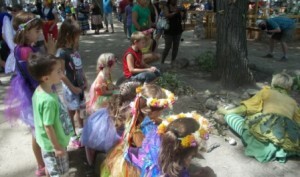 We saw a yellow fairy stacking rocks and getting a lot of help from the younger kids. The green fairy was playing in leaves. There was a blue fairy who was just running from one place to another and dancing around in between. The wood fairy who spins the web was sitting by a tree. I encouraged the kids to go over and say hi. 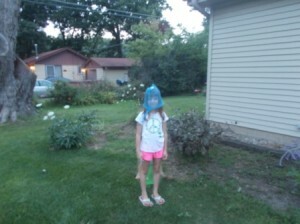 She wanted to tell the kids hello by touching palms, but their shyness prevented them. So she pulled out her bobbin of thread and made a string bracelet for each one of them. She tied the string on with such care. Needless to say, the kids were thrilled. I thought Rich was sitting in the shade, but I find him wondering around. Why wasn’t he sitting down and relaxing? He said he was, but one of those fairies was bothering him. I think it kind of freaked him a bit and he preferred not to have them sneaking up behind him to provide entertainment for others. Next, we moved on to the fencing school. This is an arena set up to put two combatants in a ring with modified swords. Don’t worry, the kids wear padding and helmets. They are just trying to pop a balloon on the top of the other guy’s head. You usually get brother against brother, sister against sister, or even sister against brother. If the older kid is too tall, they might have to fight on their knees. It’s actually pretty fun to watch. The first contestants were a 9 year old sister against a 6 year old brother. She had height, but he had heart. We walked on around to the Queen’s Meadow, but she wasn’t out yet. Apparently, there is a unicorn in the area and one of the showman was working really hard for us to go in and see it. Since the kids weren’t super thrilled, I didn’t opt to pay the price for that attraction. We moved on to the Dirk and Guido Swordmen’s Show. 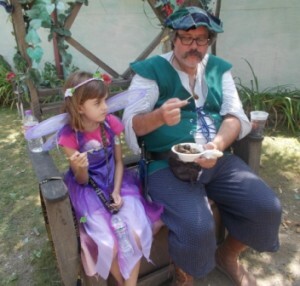 Dirk and Guido are celebrating 25 years at the Ren Faire. We’ve probably seen most of their shows then. The show is part comedy and part swordmen. All of the jokes go over the kid’s heads, but they like to watch the fancy work with the swords. Cael was especially interested in the swords. We headed out to take care of the bathroom break and clean up for a little lunch. Rich took Bel off to find food. They came back with BBQ and a turkey leg. I think they like the same things. I got a chicken basket and fish and chips. We ate pretty well. All around, people were coming and going. You just never knew what you would see. Next, we headed to the front of the town to look at the pirate ship and walk across the long bridge over the pond. First, we got stopped by the Queen’s parade. The kids learned a new word, huzzah. This is the cry you make to exclaim something, like when you cheer for one of the groups or for the Queen herself. It was cute when the Queen’s champion said good day to Bel. The bridge is always a busy place. Everyone wants to stop to see the fish and the turtles. There are lots of them to see. Luckily, it was pretty clear going in our direction. The other side was pretty packed. I think the kids got to see quite a few turtles on our way across. That took us into the marketplace by the lake. We stopped in at the tannery to feel the pelts and check out the skins. Now they can say they have touched the pelt from a silver, gray, red, and other types of foxes. There were bison skins, sheep, and several other pelts lying around as we walked through. The pirate ship didn’t have a lot to do. For $5, you could swab decks, raise the flag and other things. No one seemed to have interest in doing these. Before we left, I saw a mermaid being pushed around in a wheelbarrow. Hope she was staying wet though. 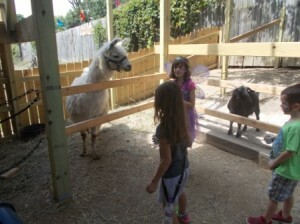 We worked our way back around and went over to the petting zoo. 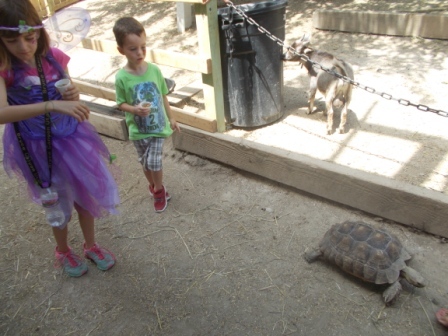 No kid’s day is complete without petting an animal of some sort. 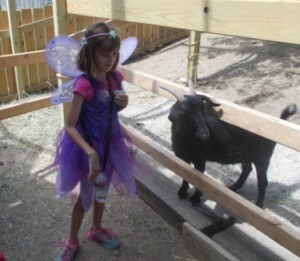 There were goats, sheep, cows, donkeys, a llama, a land turtle, and even pygmy goats. 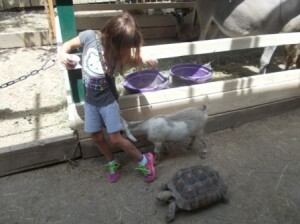 We had feed and walked around the animals. There was a porcupine on a shelf, but he wasn’t something you could pet. Time to go check out the Kids Kingdom. This is an area strictly for kids. There was a magic show happening on the stage when we arrived. The kids weren’t interested though. 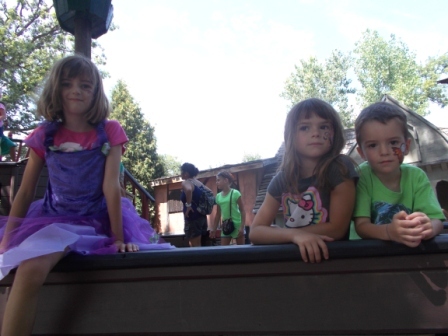 I took them through the town façade and the pirate ship. They just weren’t feeling it. We hung around a bit in the area as Rich and Bel were enjoying some garlic mushrooms. Cael and Sophia did find a bridge and old tree trunk that had some promise for climbing. When asked what they want to do next, those kids want to look for more fairies! I explain that those are the only fairies in the place. They want to go and look at them one more time. So off we head for the spider web. Rich finds a seat in the shade. He said he would take his chances with the pesky fairies. Cael prefers to stay with Uncle Rich and play around the nearby tree. 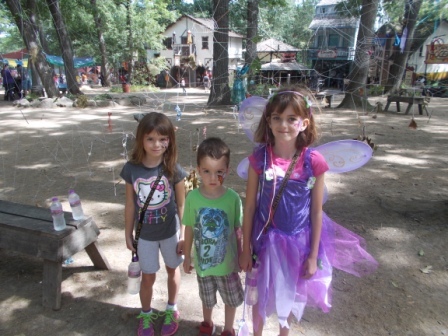 The girls and I go off to look at the fairies for one last time. Really, one last time. In the meantime, I called Rick, who is coming from the Mud Show to meet us. We have to plan out dinner. My plan is for him to stop and pick up the food on his way in. I hand over the money required to buy the feast and bounty. He and Carrie are planning to hang out a bit more before heading out. With a heavy sigh, the kids finally give in and we head toward the gate. Rich leads us through the crowd. We are like a line of ducks as we follow him out. The kids keep up the pace and manage to weave in and out of the elbows and knees in their way. Me, I just trudge on and push my way through where needed. I can’t believe how crowded it is. When did that happen? The drive home is quiet. I think everyone is tired from walking around all day. At home, we change into comfortable clothes and get out of the costumes. 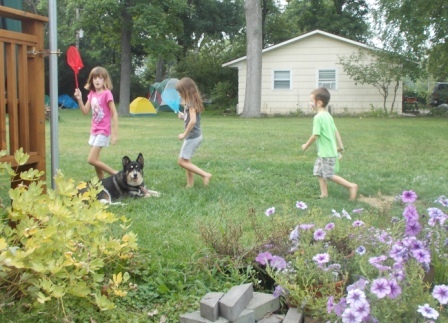 The kids want to go outside and play in the yard. I have to feed Sascha first and she isn’t taking no for an answer. This means more dancing as she sees food in the bowl. The kids bring their chalk outside and draw on the new blacktop. I see a sun, moon, butterfly and other shapes taking form in bright colors. It’s not long before they are done. It’s back inside for their nets to chance bugs down. At one point, Bel decides to brush Sascha down to try and remove the loose hair. I tell her good luck. She soon finds that’s a never ending task. It just brings up more hair. Sascha doesn’t mind though. She loves to be brushed. The kids want a snack. Since I’m weeding the patio, I send them inside to ask Uncle Rich. It’s time for a Zurek standard. They get peanut butter and honey sandwiches. Then it’s back outside to run around the yard a bit more. Rich comes out to do hot tub maintenance. With a million and one questions, they help out. Mostly, they stand around with their hands in the water. Then came the inevitable question: Can we hot tub? Sure, but later on tonight. Unfortunately, the heater is on the fritz again so the water is only lukewarm. Rick finally arrives with dinner! We go inside and wash up. 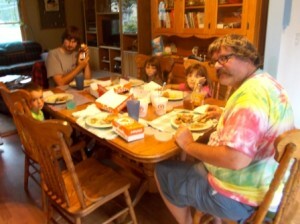 We are having chicken from Popeye’s with mac-n-cheese, potatoes and gravy, and dirty rice. We manage to find something we all like and eat up. It’s been one of those days. The kids scrape their plates and stack them on the counter for the dishwasher. Time to jet off and play some more. Rich and Rick take Bel downstairs to teach her somethings about guitars. She has her own electric guitar and they want her to start learning her finger exercises. I hear lots of guitar playing until the phone rings. It’s Vanessa and Chris checking in. I remember the days when I missed my son during vacations away. You think you’ll enjoy the quiet, but it can be a little too much. The kids have been so busy they haven’t even asked about going home until this evening. They just wanted to know how many more days they had to do things! After the phone call, I put them in for baths. They have to get somewhat cleaned up to go into the hot tub later. Sophia asked to watch TV and Frozen is on. It’s surprising that everyone knows the words to all the songs. After baths are done and the movie is complete, they change into bathing suits and I grab them some towels. Time to check out the hot tub. I guess it is like a small swimming pool. They paddle around a bit and get pretty well wet. I pull them out when I can take the mosquitoes anymore. Now, it’s back into jammies and ready for bed. Strangely, it’s quiet in the bedroom tonight. There isn’t much chit chat or noise. I see some blinking eyes, but they are slowly sinking into sleep. A long day is done. Shhhhh! 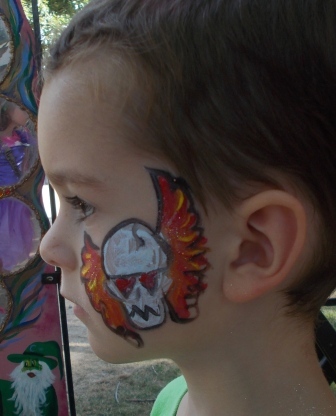 Skulls and flames for Cael’s facepaint. 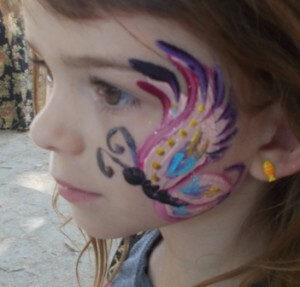 Sophia got a fancy butterfly for her face. 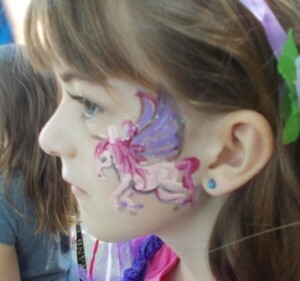 Bel got a Pegasus unicorn for her face. Kids in front of the spider web. Close up of the blue green fairy. 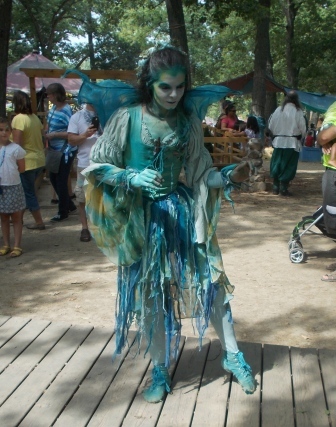 First sighting of the blue green fairy. 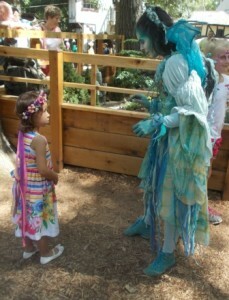 Blue green fairy fascinated by someone else at the faire. 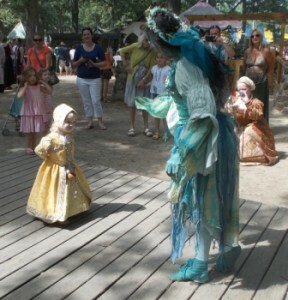 Young faire-goer dancing with the blue green fairy. 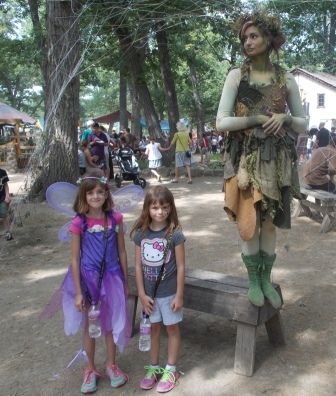 Girls with one of the woodland fairies. Watching yellow green fairy stacking rocks. 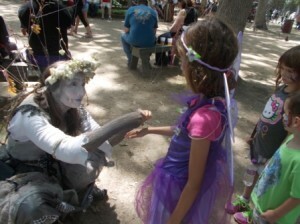 Bel getting her bracelet from the woodlawn fairy who does the spider web. 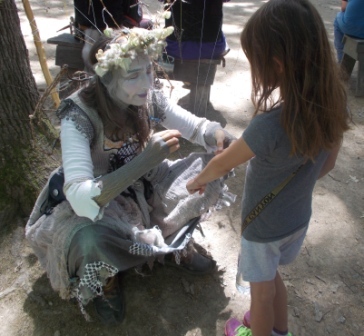 Sophia getting her bracelet from the woodland fairy. Cael and Sophia waiting for lunch. 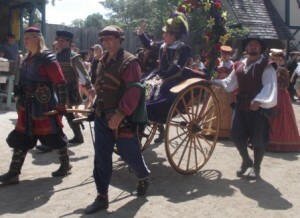 Queen Elizabeth in the parade. 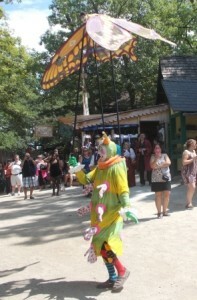 Butterfly puppet from the Queen’s parade. Bel having a standoff with a goat. 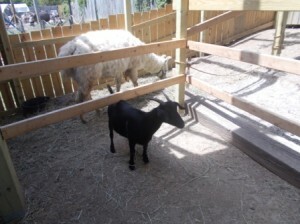 Pygmy goat trying to take Sophia’s water bottle. 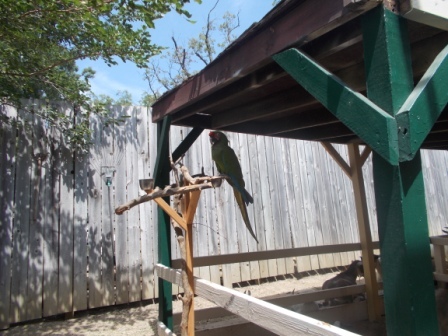 Parrot at the petting zoo. Making friends with the llama. Llama and goat in the zoo. Following the turtle around the zoo. Taking a minute for a photo op. Kids on deck of the pirate ship. Cael found a cool log to climb all over. Rich and Bel sharing garlic mushrooms. 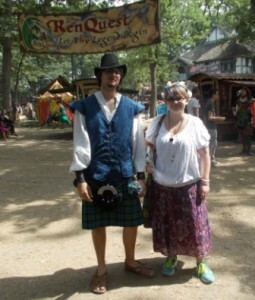 Rick and Carrie at the faire. 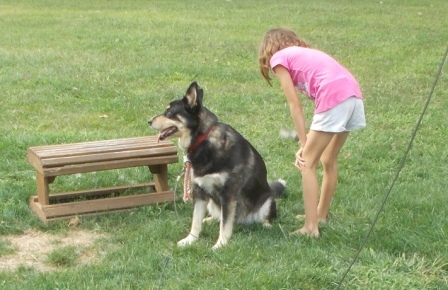 Bel brushing Sascha in the yard. Sophia and Cael taking a break. Another type of parade around Sascha. 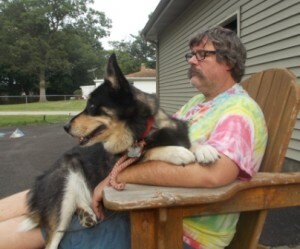 Just a little lap time from Dad. 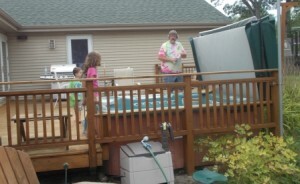 Helping Uncle Rich with hot tub maintenance. So it was a slow day. The kids slept in until almost 9:30 this morning. Rich and I got up early and got our day started. That meant coffee and the paper. We messed around in the office with our computers and personal accounts while we waited for the kids. Rick got up around 8:00 and stated that they were still talking when he went to bed last night about 10:30. That explains why they were up yet. So somewhere before 9:30, they finally came crawling out of the guest room. By this time, Rick and Rich had had their breakfast. 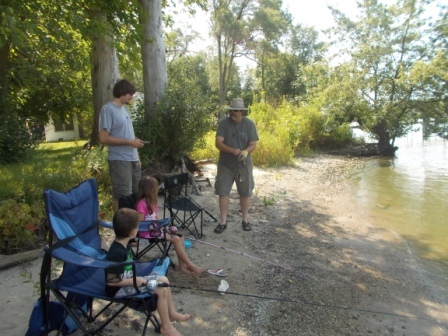 Rich explained that they needed to get dressed and eat if they still wanted to go fishing this morning. It was getting late and the boats were already starting to roam up and down the river out there. The boats tend to get in the way of fishing with the noise and the waves. I got cereal for everyone while they got dressed and found their shoes. After they ate, Rich and Rick gathered up everyone up and headed down to the river. I stayed to clean up and get things picked up a bit. Then I followed them down to watch the fun. 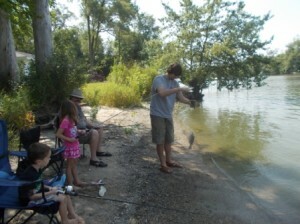 By the time I arrived, Cael had caught a drum. Sophia and Cael caught a couple of blue gills. Rich caught a small catfish. The boats were already running up and down the river. This was putting quite a bit of wake into the water. Everyone was being patient and trying to put in the time to catch the fish. Cael and Sophia were missing most of the bites on their lines. In spite of this, they still managed to catch a couple more fish. This wasn’t Bel’s day though. She came away without a fish. Maybe that’s because the fish remember that she caught everything last time. We finally called it quits and packed up the bunch to head back to the house. There was another group of fishermen at the point there as well. I don’t know what they were speaking, but it sounded Eastern European. They had some fancy tackle with them. I was pretty sure I heard some electronics on that one guy’s reel as he was bringing in a fish. But they weren’t doing much better than any of our group. Back at the ranch, we put away our tackle. Everyone put on their tennis shoes and slathered on some sunscreen. 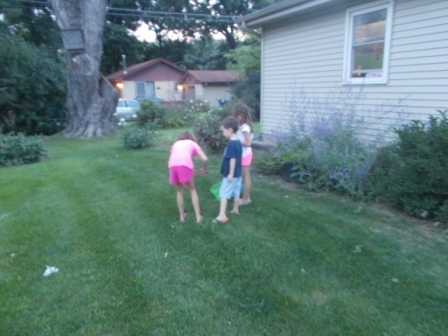 Rich took them out to the garage to apply bug spray. We were going hiking. 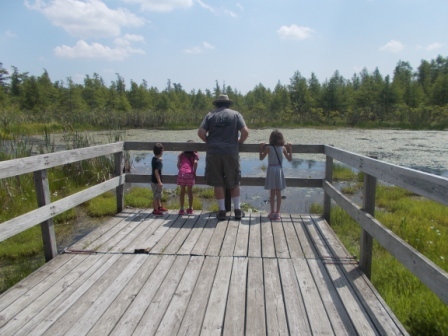 Rich thought it might be nice to go out to Volo Bog and hike the bog trail. 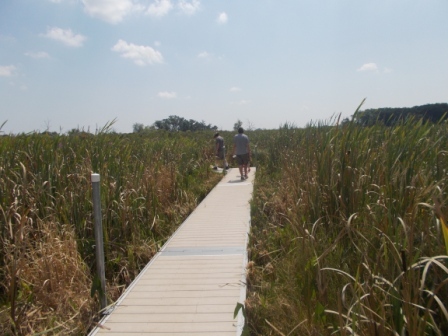 This is an easy trail that is basically boardwalks out over the bog to the remains of the lake in the center. It is very springy and soft as you walk. Even the boards on the walk have bent and contoured to the soft ground underneath. Rick took Bel in his car. This would allow her some freedom without having to squish in the back between Sophia and Cael. We had to take two cars anyway to get us all there. Hopefully, Rick was talking to her some. She didn’t seem too unhappy about riding with him. We brought bottles of water to keep hydrated. You never know on a hike. Better to be prepared. We stopped off at the visitor’s center to use the restrooms before heading down to the bog. There are some long trails, but the bog is pretty short. 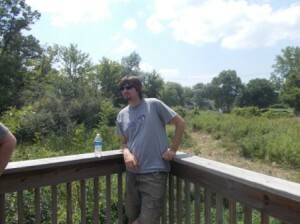 Cael was amazed at the trail out over the water. 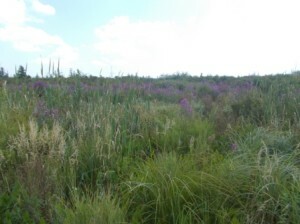 There were lots and lots of cattails growing on either side. You could see water with the mosses growing on top. We got almost to the center when Bel’s stomach started hurting. She had gotten sick while in Seattle on vacation. Unfortunately, I think the remains of the illness were still with her. We had been pushing water, but she just hadn’t gotten enough. She spent a few minutes hanging over the trail. Then we went on down to the lake. There were lots of turtles in the water. Little heads were popping up all over the places. The kids thought this was cool. Heading back up the trail, we stopped at the koi pond to look at the fish swimming around. This is more of a natural pond with lots of little fish. 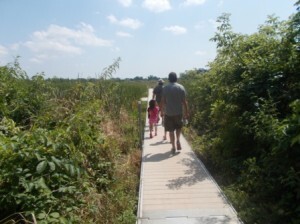 The park had installed a boardwalk that took you down the side of the trail and out onto the water. 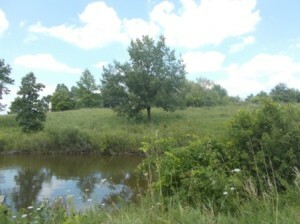 From here, you could see the birdhouses used to collect more information about the native birds around the bog. We decided to walk down the Tamarack Trail a bit. 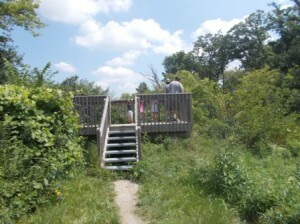 There is a cool overlook that looks over one of the lakes. We could see lots of turtles hanging out on the logs through the low blueberry and other berry bushes around the lake. We found that Cael can walk pretty fast. He was good at keeping up with Rich at the head of the trail. Bel and I were bringing up the rear. Neither of us walk very fast. Toward the end, Bel was getting tired. I can’t blame her. I was tired too. I don’t think she was feeling too well from earlier. We met everyone else up at the visitor’s center when we continued at our own pace. In the visitor’s center, there were displays that told you about the bog. They had recreated the spongy walking surface. There were stuffed animals and skulls from animals that live in the area. At the entrance is a coyote with a squirrel in his mouth. Reminded me of Sascha when she manages to catch a squirrel. Sophia enjoyed playing the birdcalls from the set of buttons that labeled each bird. The speakers overhead played the call when you pressed the button. After going through the displays, it was time for lunch. We got back to the cars and headed to Happy Jack’s. This is a little place up in McHenry that serves sandwiches and stuff. The entire place is decorated with Coca-Cola stuff. It is red and white everywhere! We ordered our food and settled in to wait. Everyone thought the bog was cool to walk on. The turtles were the best part for some people. After hot dogs, chicken nuggets, or sandwiches, we all felt a little better. Then it was time to go back to the house. Sascha was glad to see us when we got back. But some of that might be because it was almost time to eat her dinner. She did her best dance when it was time to put the food dish on the floor. We rested up for a bit. It was nice to put our feet up. I decided to put weeds out front. 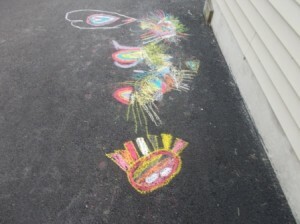 Bel, Sophia, and Cael decided to take their chalk out to the driveway and make some pretty designs. Before long, the three of them were out front entertaining me while I finished pulling up weeds. I had given them bug nets for their stay. They all disappeared for a minute and then returned with their nets to try and catch more bugs. There wasn’t a lot moving around out front. The bees were enjoying the flowers, but that’s not something you want to catch. I was done, so we moved back into the house. After taking a shower, it was time to start dinner. Tonight was simple. I made mac and cheese for everyone along with spam and green peas. Each person could add what they wanted to their plate. Of course, Rich added it all. I also put peas and spam into my mac and cheese. Cael tried the spam and found out he liked it. Sophia wasn’t so sure about the spam. Bel was strictly mac and cheese all the way. I think Rick took only the spam as an additive. Overall, we did pretty well for dinner. After cleaning up and loading the dishwasher, we took Sascha for a walk. The kids weren’t keeping up so we let Rich and Sascha continue on without us. Probably a little too much walking today. 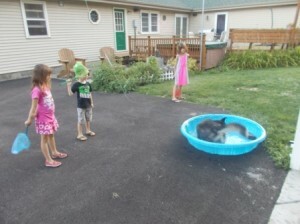 We went back to the house and prepared Sascha’s pool for her. It was warm and I was sure she would look forward to rolling around in it. And she did. Rich headed down to the lake to try some more flyfishing. Each of the kids took a bath. Then it was time for a movie as we settled in for the evening. It was going to be an early evening and have some quiet time. Tomorrow will be a busy day. I think the kids are tired today anyway. Rick went out to join his friends for Lakemoor Fest. There are fireworks that they have done every year since we’ve moved here. This will be his last year, I assume. Rich caught a small catfish. Heading out on the bog trail. 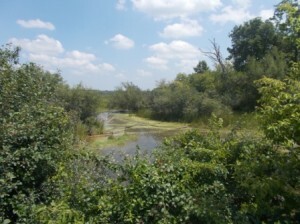 Path leading out to the center of the bog. 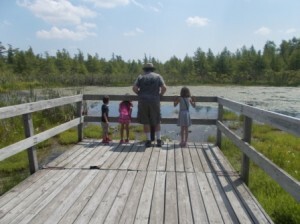 Looking for turtles in the bog. 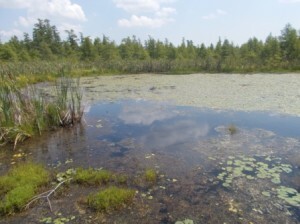 What remains of the lake in the bog. Watching the koi in the pond. Purple everywhere throughout the bog. Lake on the trail where the turtles were sunning themselves. 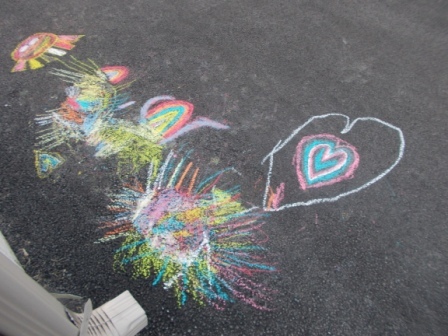 The kids used chalk to draw on the driveway. Pretty colorful. Another angle on the chalk drawings. The kids watching Sascha in her pool. 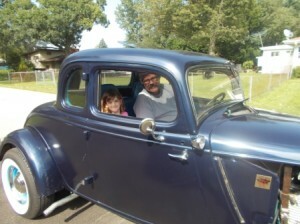 Today, I was driving to Stevensville, MI to meet Vanessa to do a kid exchange. Rich and I are taking her three kids for a few days. This is my way of practicing for grandkids, I guess. 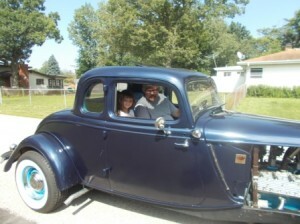 We did this last year while Chris was working in Romeoville so that Vanessa could come join him for a week. We enjoyed it. I think the kids kind of liked it. Just seemed like the summer thing to do. Driving out to Michigan was no picnic though. I thought I had allowed enough time to drive out with some construction. Who knew that every few miles was new construction! That and the fact that everyone was going 40 MPH, even in the clear areas. It was Friday, so I guess all the Chicagoans were on their way to Michigan for their weekend outings. It took me almost 3 hours to get there. I’ll have to remember that going back to drop the kids off. I probably worried Vanessa somewhat with arriving late. Kids were exchanged and I headed back to Holiday Hills with a full load of suitcases, backpacks, sleeping bags, and pillows. Oh yeah, and kids! Once into Chicago, I had one sticky spot with traffic. But the Goodyear blimp went overhead while we were waiting so the kids had something to follow and talk about. Thanks, Goodyear. They were talking and playing in the back until about 40 minutes from the house when they all decided to nap at once. It got really quiet then. I could hear them breathing deeply. Not one eye was open. As soon as I turned into the neighborhood, they were starting to stir. Good timing on their part. Once we arrived, I put them to work. I did let them take a bathroom break first. Then it was on to hauling in all of their stuff and finding a place for it in the guest room. With all suitcases, backpacks, sleeping bags, and pillows stowed away. It was time to explore a little. Uncle Rich took them out to the garage to visit with Sally. One thing led to another and he was taking them for a ride. Cael was up first. 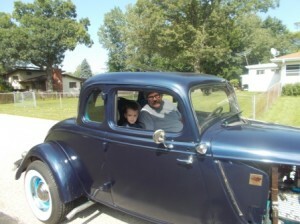 With booster seat installed, Rich and Cael headed out and around the neighborhood. 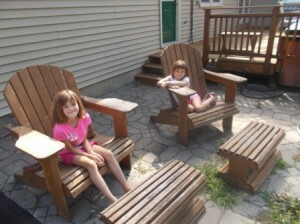 The girls and I sat on the patio with Sascha and awaited their turns. One by one, they each got to go for a spin. Of course, I’m documenting most of the moments and this one went into the camera also. Brad, our neighbor behind the house, had a question for me. He also had an interesting insect to show us. There were some wasps in the process of laying eggs into a stump in his yard. He was fascinated by it and wanted to share. I had never seen anything like this wasp. It was black and very fragile looking. One of the wasps had finished laying eggs and the deposit tube was sticking out of the stump. Brad pulled it out and it looked like a piece of black steel. It was very cool. Apparently, they are good things to have as they eat other insects in the garden. With car rides and insects viewed, it was time for dinner. We were having BLTs with the fixings. Cael just had a B while Sophie and Bel had BLs. The best part of the meal were the homegrown tomatoes straight off the vine. They were so good. You can just taste all the sunshine, warmth, and energy in them. It’s the only time I like tomatoes. Since I hadn’t prepared for the kids to be here, it was time to go to the store and let them pick out some of their favorite things. This was also time to work on the art of negotiating. Since there are three of them, they had to come to a compromise on what to buy. We discussed their preferences and what they were willing to accept as a choice. I discovered that Sophia doesn’t comparison all that much. She know what she likes. We came away with most everything we planned to get. I’m sure there will be return visits. At dinner, their main concern was dessert. Can’t say I blame them. We decided to go to Julieann’s to take care of that issue. This is our favorite frozen custard place. The kids said they didn’t know the difference in ice cream and custard. This will be a new lesson then. Bel got chocolate in a cup with caramel sauce. Sophia got chocolate in a cup with sprinkles. Cael just got vanilla in a cup. Rich got flavor of the day, which was Cherry Brownie Bomb (vanilla custard with brownie bites and cherry sauce). I just got chocolate in a cup. For some reason, the girls behind the counter thought Rich was getting the alcoholic version of flavor of the day and he was getting his serving. Finally, Rich convinced them it was simply flavor of the day and he joined us outside. Back at the ranch, the kids gathered up their bug nets to try their look at netting some bugs before bed. Bel did manage to find one firefly. It was still early for too many of the good bugs. We did find a lot of crickets in the yard. There was a dead luna moth lying in the yard. We checked this out for a bit. I had asked Rick to bring out my camera. Bel asked how I did this. I told her Rick was in his room and I had asked through his window. Her eyes lit up and she asked, “Can I talk to him? I want him to clean up his room.” Wow, I had been asking him the same thing. I told her she was more than welcome to go and bug him about it. Off the three of them flew into the house and into Rick’s room. I followed a little more slowly to avoid the fireworks. I brought Sascha in and we all headed for Rick’s room. This should be good. Sascha and I got comfy on the bed as the kids were asking questions. Bel was making it a point to ask Rick when he was cleaning up his room. She got the same non-committal answer I get. She informed him his room was too messy and needed to be cleaned. We hung out and talked to Rick about his computer, game, and what we were doing for tomorrow. After that, I turned on TV and found the first “How to Train Your Dragon” movie was on. The kids settled in for some quiet time before bed. During commercials, Cael would sneak into the bedroom to lie down on the air mattress where he would be sleeping. I think he was excited to be sleeping there. After the movie, it was time to get into jammies and brush teeth. Everyone made the rounds for the bathroom. A nightlight was requested, but I didn’t have one around. I need to find something appropriate to use in there. I’ll have to look around and see what I can find out. I went off to bed. I’m tired. Rick said this morning that he went to bed at 10:30 and they were still up and talking among themselves. That explains why they are still in bed asleep at 9:00 AM. 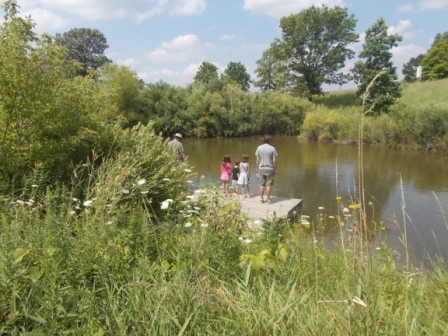 Activity for tomorrow: Fishing, hiking, and maybe some play time out at Fort McHenry Park. Have to check out the chance of a movie at the drive-in. Bel and Sophia hanging out on the patio with me between turns. Cael returning for his tour of the neighborood. Sophia is buckled in and ready to go. 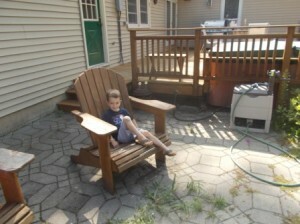 Cael hanging out on the patio after he went for his turn in Sally. Bel finally gets her turn to go around the neighborhood in Sally. 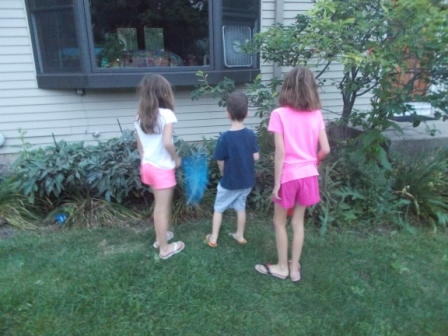 Beating the bushes for bugs in the front yard. Looks like they did catch something in their nets. Sophie and her bug catch of the night. 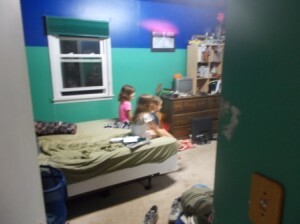 Not a good photo, but just had to show the kids in Rick’s room interrogating him. Friday afternoon started our next adventure for the weekend. It was going to be all about music, fun, food, and more fun. We had reservation to spend the night downtown. 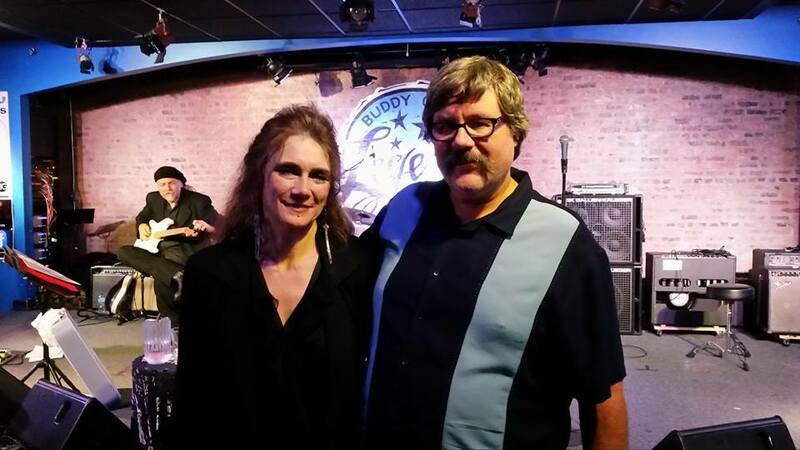 CeeCee James was in town to play at Buddy Guy’s Legends. Rich had been following CeeCee for a while. She is amazing. CeeCee is a blues woman out of Oregon. She had won Best Song this year at the Blues Awards in Memphis. I hate to state it this way, but CeeCee James has the voice of Janis Joplin and the blues chops of such greats as Howlin Wolf. On vacation, I had become more acquainted with CeeCee’s work since Rich had put one of her albums on one of the jump drives we used for our music while driving. I was more than a little impressed. I love her voice, but her way with a song got me. You could tell this was a professional who knew how to present the material to you. Enough about that. We left the house and headed to the train station. We were hopping the 3:03 train for downtown Chicago. As we waited, we realized our fellow travelers today were headed down to Lollapalooza. Most everyone was 16 to 30 years of age. The talk was most inane and teenage. When had I gotten so old? The train filled up fast as it stopped at the regular stations to pick up other travelers. We arrived on time into Ogilvie Station. After waiting for the car to clear, we made our way out and down to the platform. It was a sea of bodies, backpacks, and suitcases. The flow of the bodies took us out of the doors and to the top of the escalator. There were more people on the floor below. Outside, we found a cab and gave the driver our destination. By now, it was definitely rush hour on a Friday in Chicago. We had seen the lines of trucks and cars on the expressways into town. It was going to be a busy drive going anywhere tonight. I didn’t envy the cab driver trying to negotiate the street traffic. Cars seemed to be everywhere. Pedestrians were jaywalking and just stepping out of nowhere into the street. Watching everyone, I realized there was a new dress code for the twentysomethings or older. I decided this should probably be called urban weekend wear. The mix was pretty much bermuda shorts in a rainbow of sherbert colors on the guys with typically long sleeve shirts rolled to the elbow. It was 82 degrees outside. Weren’t they hot? In contrast, the girls are in the briefest of short shorts with tanks or even tube tops. Rich wanted to know when the 70s came back into style. We arrived at the hotel and paid the cab driver. Inside, people were congregating in the lobby. I like this boutique hotel because the clientele tend to be Europeans on holiday. Just never know who you will meet in the elevator. Besides, it is just around the corner from Buddy Guy’s. We checked in. Since it was Lolla weekend, we had to sign a statement that we would behave, not destroy property, and abide by quiet time hours. What goes on when these kids are in town? I signed it since I figured we were in no danger of breaking any of the rules. Oh yeah, we also had to have a bright neon green wristband applied to our arms to prove we belonged here after hours. The elevator got us up to our floor and we discovered that our room was directly across from the elevator. Quick and easy in. Unfortunately, the bed wasn’t the king size that I had ordered, but it would do. We just needed to sleep once we returned. I changed clothes and we headed out. Downstairs, we made our want to Buddy Guy’s. This is just one block up and one block over. We got in the door to find the place was basically empty. This was not the filled to the brim place we tried to squeeze into last year. The bouncer at the door stated it was early. We were more than welcomed to come in and find a table. We could camp out all night and no one would try to kick us out. Sounded good. We walked around the floor and Rich picked out the table with the best vantage point of the stage, without putting us on the stage. I was happy with it. It was getting to be around 5:30 at this point. The first act was tuning up and getting prepared to start his set. Looking at the beer menu, we see that there is something special called Buddy Brew. The waitress tells us it is a wheat beer. That sounds good for the summer and easy to drink. Rich gets his first one in a commemorative glass. It says: Damn Right This is Buddy Brew. Nicholas Barron takes the stage and sings us into the beginning of our evening. On the way into the bar, I almost ran into a guy in a wheelchair. Now, I’m not normally that clumsy. I kind of turned around and there he was. He apologized and I walked around. Later on, this guy is in front of us with his beer listening to Nicholas play. After a couple of comments, he introduces himself as Terry and he seems to be a regular that everyone knows. We talk off and on through the evening until the place starts to get packed and I assume he went home. We ordered appetizers to get us started. Rich got the fried okra and I got the crab cakes. The crab cakes weren’t bad. The okra was a little spicy. It was a little more than I could take; but for okra, it wasn’t bad. Nicholas took a break and then returned for his second set. He played a lot of 60s soul and folk tunes around some blues numbers. His regular gig is Sunday afternoons at Buddy’s. This was just his fill in spot apparently. Rich went up to check out what t-shirts were available. He came back to the table and said that nothing struck him as something he had to have. He said he thought Buddy Guy was sitting at the bar. I thought he was in California for the Mammoth Lakes blues show. Trampled Under Foot was arriving there today to play this weekend. I was sure I saw Buddy’s name on the list of performers. I decided I had to check this out. It was totally unexpected to have Buddy here. I went by the bar, but didn’t see anyone I could recognize. At the desk, I was checking out the shirts. The guy behind the desk told me I should buy a poster and he could have Buddy sign it. I asked if Buddy was here and heard that indeed he was sitting at the bar at that moment. I saw a nice poster I liked and agreed to come back with money. I went back for the dollars and told Rich he was right. I explained about buying a poster and getting Buddy’s signature. At the front, I purchased the poster I wanted. The guy found a nice cardboard container to keep it in. He got out a Sharpie and handed it to the girl behind the desk telling her to have Buddy sign it. I was going to wait at the desk, he told me to follow her. I did, pronto. A young couple was trying to approach Buddy when we arrived at the bar. He didn’t acknowledge them and turned to the girl with my poster. He signed it and I said thank you to which he replied, “You’re welcome.” Apparently, you have to buy something for Buddy to talk to you. 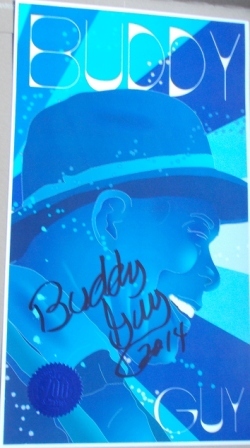 I was so thrilled to have talked to Buddy AND gotten his signature. Once the ink dried, I packaged away my new found treasure. I protected it the rest of the night. A couple of beers later, we ordered dinner. Rich went for the jambalaya with cornbread and I got the crawfish etouffee. When the plates were delivered, we discovered we should have just ordered one. The helping was huge! There was no one either of us could finish these off by ourselves or even with help from the other one. They were delicious though. So the second act comes on. A lot of people dressed in white clothes appeared on the stage. There were four singers, a bass player, a drummer, and a keyboardist. They milled around for a while. A lady came out to the stage to introduce the singer. She had us pronounce the name correctly a few times. La Wandia. OK. So a singer in 4 inch heels and a very tight, short dress came on. OK.
LaWaundia appears to be a gospel singer trying to figure out how she can set herself apart from the other acts. She has a great voice, but she doesn’t really seem to know what to do with it. The songs were okay and she did a good job with the sounds. The place was filled with people who knew her, so they were getting into the songs. At about this time, Lolla was over and the kids were coming into the place to continue their musical experience. Every table was filled and there was standing room only. This is what we wanted to avoid. An older gentleman came by and asked to sit at our table. We said yes. No reason to share. Besides, everyone who worked there seemed to know him and made sure to say hello to him. Made me wonder later who he was. Then it was time for CeeCee James. I must have been having a bad night because I almost ran into CeeCee when I first entered the place. She was crossing in front of me headed to the bar while I was looking around the place. I stopped up short to let her cross. I saw the side of her face and recognized her right away from photos on her website. It was definitely CeeCee. The band was prepping the stage with their setup and instruments. There seemed to be a big disagreement about where all those guitars were going. CeeCee made a decision and left the stage. The guy moved the entire rack of guitars again behind her back. Finally, the show was ready and CeeCee kicked it off. It’s a little unfair to say that CeeCee sounds like Janis Joplin. CeeCee only sounds like Janis, but better. This is a more mature voice with a lot of richness. This might have been what Janis could have been later in life. CeeCee is a great songwriter as well as a singer. Many of the tunes are hers with a few older, well established songs thrown in. Also, CeeCee has a very gritty side of her that you get from listening to her stories and life experiences. I loved this part of the show. 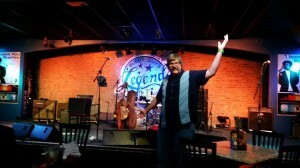 After the first set, I told Rich he should get his newly purchased CDs signed. He hesitated and claimed he was shy. Not me. I got out my Sharpie that I brought along for the occasion, grabbed the unwrapped CDs, and went to the stage. I asked CeeCee to sign them. When she asked who they should be made out to, I said to Rich. She looked at me funny. I explained that my husband was too shy to come up himself and I pointed at him. She waved at him and laughed. Successfully personalized another set of CDs! People started getting their pictures taken with CeeCee. I pushed Rich up toward the stage. She was so gracious about putting her arm around him and letting me snap away. She was so nice. The second set started and we settled in to listen. People were slowly melting away from the tables and moving to the door. Not us. We were here for the duration. A few diehards hung in there with us. These were the twentysomethings. Pretty soon, these drunken souls were on the floor and attempting to dance. They weren’t very good at it. That didn’t stop CeeCee from encouraging them and interacting as she worked her way through her last set. I realized that Rich hadn’t bought a CD for Chad at work. Chad has become a CeeCee James fan through Rich’s invitation to listen to some of her songs. I went to the desk and bought the Seriously Raw CD for him since I liked the songs on here the best. At the end of the night, I asked CeeCee to sign it as well to Chad. She probably thought I was the biggest pest. Chad should be happy though. So the last song was played and we all begged for an encore. Apparently, the club has an agreement to stop playing music by 1:00 for the sake of their neighbors. That was too bad. I think CeeCee wanted to do more. We surely wanted to hear some. I did find a new guitar hero though. CeeCee’s husband, Rob “Slide Boy” Andrews is the principal guitarist for the group. He plays one mean slide guitar. He might be one of the best I’ve ever heard. I loved his style. So we gathered our poster, beer glass, CDs, and magazine. Out on the street, we headed to Michigan Ave. One block over, we walked into our hotel and verified that we belonged there. In the elevator, I couldn’t stop talking about the show. It was impressive. Rich reminded me about the quiet hours. Darn, I could keep talking about this. In our room, we prepared to bed and snuggled down for a good night sleep. I’m pretty sure I dreamt that I heard CeeCee singing to me all night with that slide guitar in the background. What a great night. My signed post from Buddy Guy’s. On Friday, we lost yet another member of our tight knit family here in Holiday Hills. One of the mighty oak on the back of our property had lost its valiant fight for life because of the drought and hard winter. He just didn’t put out any leaves this spring. I called our tree service guy, Mark, to come out and give me an estimate. 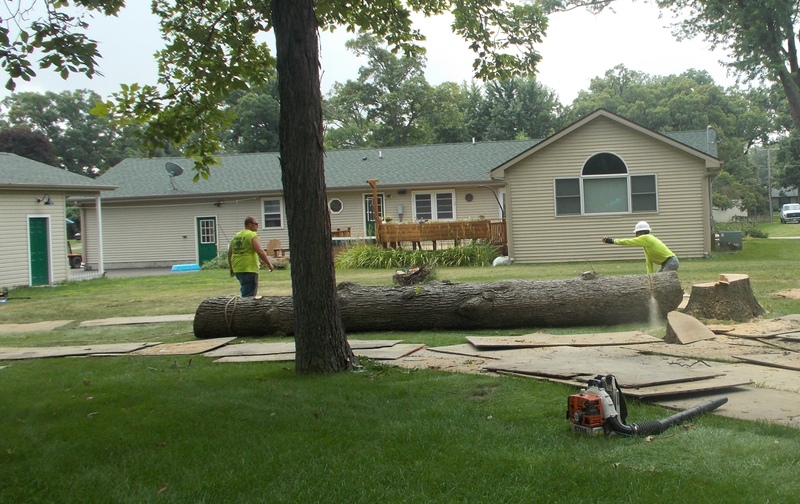 We figured the estimate would be high because of the trees position in the yard. There were utility wires running under a major branch. Then there was the fact that our septic field was right next to the tree. There was only one path to get into the tree to take it down. The work was scheduled to be done the day before we left for vacation. 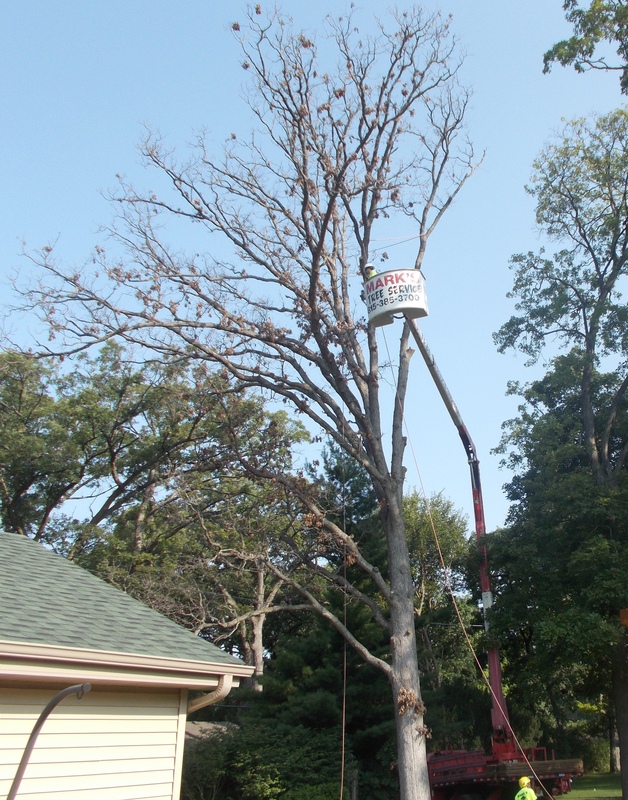 However, the rains at that time prevented Mark from getting his crew into the area to take the oak down. So it had to wait for the ground to dry out and get solid. That day was August 1. The tree was coming down. About 8:30, the first truck arrived. I think there ended up being a total of 6 trucks around the house at one time. 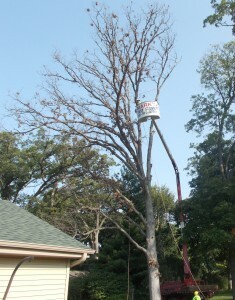 Plywood was put down on the yard where the bucket truck would need to drive to get close to the oak. That’s a lot of plywood. 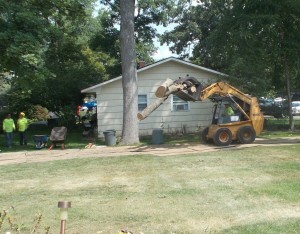 This was a platform for the bobcat as well to pick up the huge pieces of trunk. We watched at the kitchen window as the first branches started to come down. Slowly but surely, the top of the tree disappeared. The utility wires survived the first stages. After the tree had been topped out, it was time to plan for the main trunk to hit the ground. By this time, Brad and Angie, our neighbors at the back, were in their yard watching. Brad had requested some of the tree for bonfire purposes. He made sure to get what he wanted from the crew. 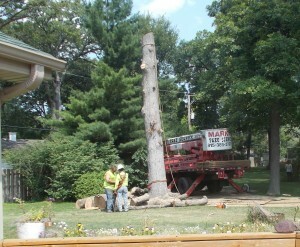 Rich and I went over to watch the felling since it had a great vantage point. Members of the crew marked out the patch where they figured the tree would fall and each mark was the estimated top of the tree location. I didn’t hear if there was a prize for the best guess. Marco, the crew chief, threw his mark out first. After everyone’s guess, Marco began the chainsaw and expertly took the tree down. After the oak landed with a pretty good thud, the check for marks was made. The last guy to make his guess won. That’s not how it looked in the video though. I think they were trying to disqualify his mark, even though witnesses to the guesses would agree that he won fair and square. The rest of the trunk was chopped up and toted away. It took two trailers to take the mighty oak out of the yard. That’s even with the parts that they had left with Brad for safe burning. So the oak at the back of the property is no more. It was sad to see it come down, but better this way than a major wind storm and destroying someone’s property. Now we’ll need to look for a suitable replacement to give us shade in the future. After paying Mark for services rendered, we headed off to our first adventure of the weekend. 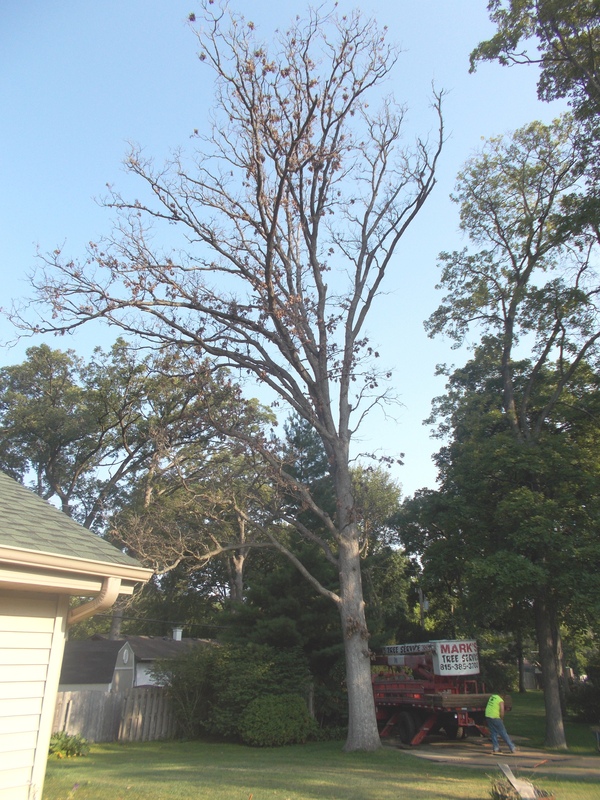 Time for the might oak to come down. Starting up in the tippy top of the tree. Down to just the trunk standing. It hit the ground with a mighty thump. Toting the trunks out of the yard.